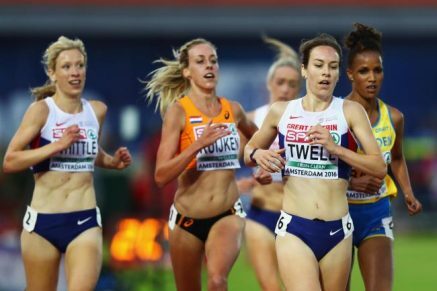 10th July 2016 – Steph Twell (GBR) continued her recent run of good form with a batting third place finish in the women’s 5000m final in Amsterdam. After a very slow and cagey opening mile the race burst into life as the 10,000m champion and recent Turkish transferee athlete Yasemin Can took the race on. Steph did not panic and ran her own race gradually making her way back to one of the two breakaway groups. With Can away there was four athletes in contention for two medals over the last lap but Steph was able to demonstrate the speed the brought her a recent 800m PB and she was not to be denied and took third place in 15:20.70. Christine Ohuruogu (GBR) just missed out on a medal in the 400m as she took fourth place. However, after a couple of recent setbacks Christine was pleased with the progress she is making and will have benefited greatly from the opportunity to run three races in three days here. A three-time medallist at the European Championships Rhys Williams (GBR) finished fifth on this occasion. After equalling his seasons best of 49.22 seconds in his semi-final, Rhys ran a strong race running blind from lane 8 to finish in 49.63 seconds. After her individual success over 200m, Dina Asher-Smith (GBR) ran the second leg for the British team that collected silver medals in the women’s 4x100m. Matthew Hudson-Smith (GBR) ran the anchor leg for the men’s 4x400m team that took the bronze.